In the next-to-last post in the “offseason position battle” series we will look at the vacant University of Kentucky closer position. The departed — Right-handed pitcher Matt Little posted a strong season as UK’s closer in 2010 during his only season with the Cats. 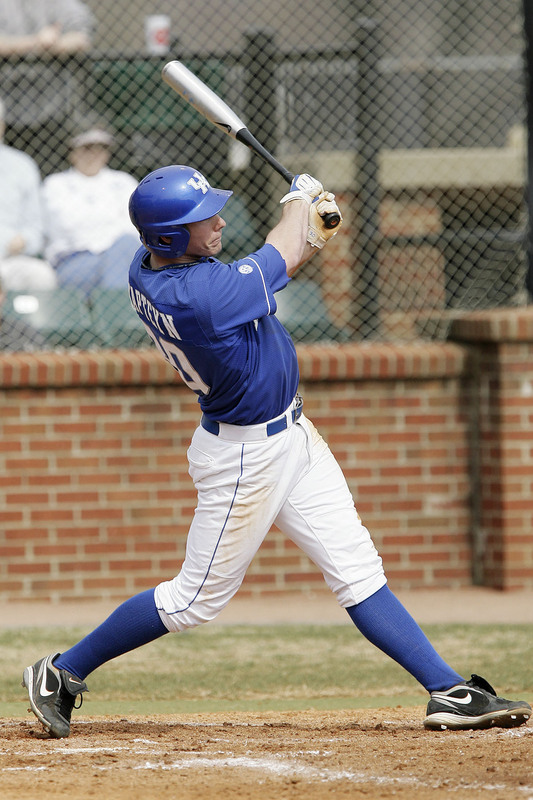 Little, who was a junior-college transfer, was selected by the Detroit Tigers in the 31st round of the 2010 draft. The Virginia native was 2-2 with a 4.93 ERA and seven saves in 2010. Little struck out 52 batters and walked 24 in 42 innings. He led the Cats with 24 appearances in 2010…Left-handed pitcher Logan Darnell, a 2010 junior and Minnesota Twins draftee, was UK’s primary closer in 2009 but served as a starter for most of the 2010 season. After returning to the bullpen late in conference play last season, Darnell saved one game in three relief appearances. Returning candidates — The 2011 closer job is likely junior right-handed pitcher and first baseman Braden Kapteyn‘s job to lose after serving as one of UK’s top relievers last season. Kapteyn was 2-0 with a 4.09 ERA and 22 strikeouts to go with 15 walks in 22 innings last season. He saved two games last season. The slugger will also likely serve as UK’s primary designated hitter, giving him the flexibility to warm up in the bullpen during the late innings. During the summer 2010 Kapteyn was 3-1 with a 0.69 ERA in 15 relief appearances for the Harwich Mariners en route to being named a Cape Cod League all-star…Redshirt senior right-handed pitcher Nick Kennedy has struggled to stay healthy during his UK career but offers the Cats a deceptive submarine look out of the pen. In his UK career Kennedy is 4-1 with a 4.21 ERA and two saves. He has struck out 42 and walked just 15 in 40 career innings. Newcomers to watch — Freshman left-handed pitcher Corey Littrell, freshman right-handed pitcher Trevor Gott and freshman infielder and right-handed pitcher J. T. Riddle were all named first-team all-state by the Kentucky High School Baseball Coaches Association as seniors in high school and could serve as valuable relievers for UK in 2011…Freshman right-handed pitcher Jonathan Paquet was the 22nd round pick of the Philadelphia Phillies in 2010 and was highlighted by Gary Henderson in a recent interview with College Baseball Daily as a freshman who could be an earlier contributor for the Cats…Junior left-handed pitcher Alex Phillips struck out 83 and walked just seven batters in 71 innings for Lower Columbia College in 2010. Wildcard — Returning middle relievers Walter Wijas and Mike Kaczmarek were both valuable weapons out of the UK bullpen in 2010. Wijas, a sophomore right-handed pitcher, was 0-0 with a 3.60 ERA in 14 games, including one start, last season. Kaczmarek, a senior left-handed pitcher, was 1-0 with a 5.32 ERA last season. Kaczmarek will likely see some time in the outfield for UK in 2011, but will be a left-handed specialist out of the pen. Either Wijas or Kaczmarek could work their way into a more pressurized role in 2011.